Home > Blog > What to do with waste heat? Neruda’s question. The topic this time is waste heat. Waste heat is produced in a number of production processes in various industries, including the food industry. Waste heat is excess heat which is not normally re-used. However, there are numerous possibilities for its use leading to significant energy savings. Reducing the energy intensity of production is the task and duty of every responsible company today, in order to reduce financial costs and protect the environment. The use of waste energy that leaves the bakery in the form of flue gas and steam and is further processed in the EkoBlock. The basic element of each bakery is, of course, baking ovens, and their effective and correct utilization has a significant impact on the operating energy costs. Besides the “mandatory” energy costs in bakeries, there are also high costs for routine operation, i.e. hot service water heating, regular heating, heating of proofers, air conditioning of work areas or the cooling of bakery products. The ideal solution for covering these energy costs is the use of “unneeded” waste energy from baking ovens, which can be processed in heat exchangers or in the next generation of EkoBloks. Waste heat exchangers are typically used in small-scale artisan bakeries with one or two ovens. Their use ensures a reduction in the temperature of the flue gases to 120 ° C to 130 ° C, and consequently to obtain 6-8% of the input energy for heating utility water. 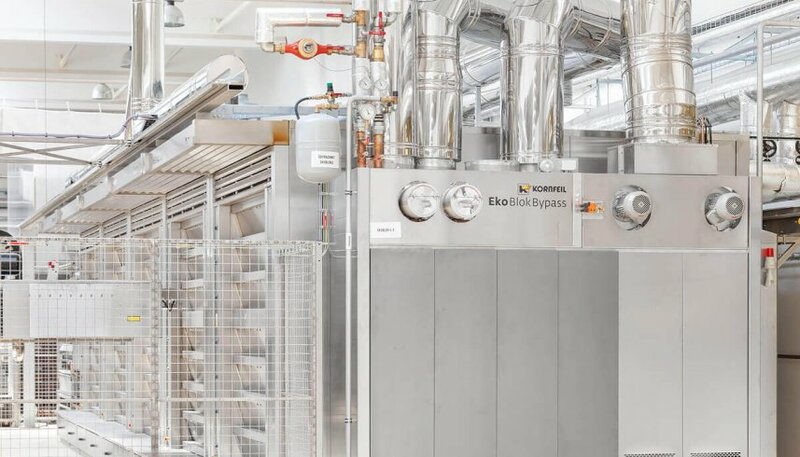 The EkoBlok Bypass has been developed to save up to 25% of the input energy for baking products, regulate steam and flue gas extraction, operate bakeries in an environmental manner as well as to protect the environment in order to maximize bakery efficiency without energy loss. EkoBlok ensures the complete processing and utilization of waste energy, flue gases and vapors from gas and oil baking ovens as well as from steam and thermoelectric boilers. Waste energy is obtained in the form of hot water at a temperature of about 80 ° C. EkoBlok reduces pollutants from the flue gas of individual ovens, including CO emissions, using so-called showering. Showering flue gases brings about the elimination of mainly sulphurous substances, including soot, thus protecting the atmosphere against acid rain. The outlet air temperature from the EkoBlok is reduced to the level of 50 ° C to 60 ° C. The use of the EKO block means the use of input energy at 93-94% for modern deck and rack ovens and 84-86% for conveyor ovens. Energy from flue gases and the condensation heat of the vapor is transferred into hot water of 80 ° C and further accumulated into separate containers for additional use. EkoBlok returns 20-30% of input energy for heating and cooling purposes. The preparation of each energy project is accompanied by a so-called energy balance, which includes the consumption of all energy and water, the heat loss of buildings and also the required power for cooling. Once this balance has been carried out, the design department will design the appropriate size of the EkoBlok or the exchanger. Part of the energy project may also be a cogeneration unit to produce electric with a backup power function. The unit produces up to twice the kW that can be used effectively for both heating and cooling purposes. The most important aspect of investing is a fast economic return and long-term sustainability. The range of economic returns ranges from 3 to 6 years, depending on the number of operating hours per week. In the case of small and medium-sized bakeries, it is possible to expect a return within 4 to 6 years. The return on industrial bakeries with the application of conveyor ovens and the EkoBlok is 3 to 4 years. Kornfeil has manufactured and sold more than 600 EkoBloks across Europe. In dozens of industrial bakeries, the use of this unique device reduced energy consumption by 25-35%. EkoBlok helps bakers reduce energy demands while protecting the environment. Corporate social responsibility not only in the field of environmental protection also plays a significant role in the Czech and Slovak Republics, as confirmed by research by the international agency TNS AISA. Research results have shown that more than 3 million people in the Czech Republic from 18 to 60 years old are interested in how a company behaves to the environment, regardless of its size. Interest in environmental protection can also be an attractive competitive advantage in the bakery industry.